In previous newsletters I have written about premises owned by NHS Property Services Limited and the proposed leases that Practices based in Health Centres are being asked to enter into. Those issues continue, with the lease roll-out programme now firmly underway. Practices have received Heads of Terms via agents acting on behalf of NHS Property Services Limited. The e-mails as received request a response within three weeks. There is no risk or penalty in not replying within the three week period other than it being courteous to do so. That aside, no detail is provided as to what happens once a response has been to NHS Property Services or to their agents, although there is speculation that the agents have only been appointed to issue the Heads of Terms. Apparently it is not clear as to who will be progressing these discussions on the landlords’ behalf. Separate to that, the much-anticipated Naylor Report was issued in March 2017. 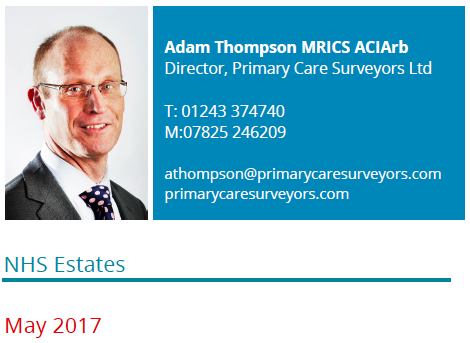 This report concerns NHS Estates in the broad context rather than dealing with just primary care premises. The report makes for interesting reading in that it also refers to acute care and issues therein as covered by a previous report prepared by Lord Carter. – Establish a new NHS Property Board, the focus being to provide leadership for the delivery of sustainability and transformation plans (STPs). This new Property Board is to be established immediately and substantially by April 2018. – Functions and residual assets (e.g. health centres) previously owned by Primary Care Trusts, should be divested back to service providers. – NHS Property Board to provide a national strategic planning and delivery unit to help deliver major projects. – Provide a single voice for the development of modern, fit-for-purpose estate, releasing land and addressing lack of maintenance issues together with proving improved guidance. – Advise on building standards in support of the five year forward view. – Any sale receipts from locally owned assets will be recovered centrally, with the money being retained locally providing it is in accordance with STP plans. – Ensure primary care facilities meet the vision of the five year forward view. The most fundamental recommendation from the foregoing is that local provider trusts be able to take back ownership of locally owned assets currently owned by NHS Property Services. This potentially is going to have a significant impact on primary care estates, particularly health centres. The other fundamental recommendation is that where sales of surplus or redundant buildings take place, the sale proceeds can be retained locally to help with the implementation of the STP. The report is comprehensive in its review of ownership of NHS property and refers to approximately 6,100 GP practices owning their own surgeries resulting in the Government (NHS) not having a property interest in the majority of primary care facilities. Whilst no explicit statement is made as to the impact of this, the inference is that the NHS cannot be certain of continuity of service provision of such facilities where the NHS has no direct control over the premises. The report encourages and incentivises local action through the retention of sale proceeds and the fundamental link between this and STPs for decision-making on funding improvements of healthcare estate, for the delivery of the five year forward view. The report does recommend that STPs should be expanded to provide estates and infrastructure plans to support identifying how the five year forward view can be delivered. The mid-term review of the five year forward view as undertaken by the Nuffield Trust, concludes that further action needs to be taken and this seems to have had influence on the recommendations of the Naylor Report. It was widely anticipated that the long-awaited revised Premises Directions would be published around Easter time. However, it is now understood that these will be withheld until after the General Election.